People came and just kept coming. David Stanwood’s concert at the West Tisbury Library was scheduled to begin at 4 p.m. and folks were still flooding in. Typical Islanders on island time. More chairs were set up. David cordially greeted the latecomers. It’s Martha’s Vineyard in the winter, and we were all glad to see familiar faces. David has spent his life perfecting the complex, somewhat arcane skills of piano tuning and is internationally distinguished for his innovative approach to improving pianos. Ten years ago he invented the Stanwood Adjustable Leverage Action that can be installed in a grand piano so that each player can personally tune it to her feel, sensibility, touch and most importantly, her artistic temperament. David has always played piano but it’s only in the last few years that he has performed for audiences, like this one, gathered in his hometown on a quiet winter evening. Recently, he has taken to recording his sessions, sometimes alone in his studio, sometimes, as here tonight, in the presence of an audience. The evening is a release party for his new CD called Six Meditations. The piano is set up in the middle of the room with the lid off and the audience seated “in the round” surrounding David. At the beginning of the concert, he invited those nearest to the piano to move right up to it. “Put your hands on the piano. Pull your chest close to it if you want,” he said. He began with what he calls an “eclipse tone.” He played one note, muted, with the other strings free to vibrate which creates “an atonal percussive sound followed by a clear ringing of harmonics,” inviting us to listen carefully as they slowly faded away, teaching us to hear in a new way. Each of the improvisations was quite different. The first, to my ears, was “modern.” No melody, no repeated rhythms, somewhat staccato ± zooming off in unexpected directions, keys and tempos. Somewhat unsettling. The second was calmer, composed of deep rich tones, flowing, meditative. In fact, I did meditate, allowing my breathing and the pulsing, aromatic colors of David’s improvisations to create a calm, removed space in which I could seek nothing. After each piece, David asked those who had experienced the piano’s throbbing emissions to exchange their chairs with others from the audience. For his third piece, I took my position at the piano, draping my fingers over its rim and pushing my chest against its side, embracing the instrument. Eyes closed, I allowed myself to find a place of non-judgment, encouraging my over-active, jabbering mind to float free from the piano, the gathered friends, the room, the time. I found myself in a familiar place, yet one that I had not visited in many, many years. Underwater. Exploring shipwrecks as a teenager. I descended into the darkening ocean toward a famous island wreck — the Port Hunter — a cargo ship on Hedge Fence shoal that I had discovered with Island friends. We swam over yawning cargo holds, floated down corroded ladders to the engine room. The piano’s crescendoing sound blended with the bubbles from my exhalations arcing to the surface. I floated, weightless, in a warm and primal planktonic soup. The deep ocean. The sound of my breathing. The embodied piano. Freedom. Following that experience, David invited musician Kanta Lipsky, an old friend, to lead a vocal accompaniment by the audience — a kind of Zen-like, collegial OM. As he played, David would occasionally signal for more volume, encouraging the at-first-somewhat-shy gathering to breath out, belt out their blending voices. For the last piece that night I sat next to Barney Zeitz watching him work on a sketch laid out on his lap. 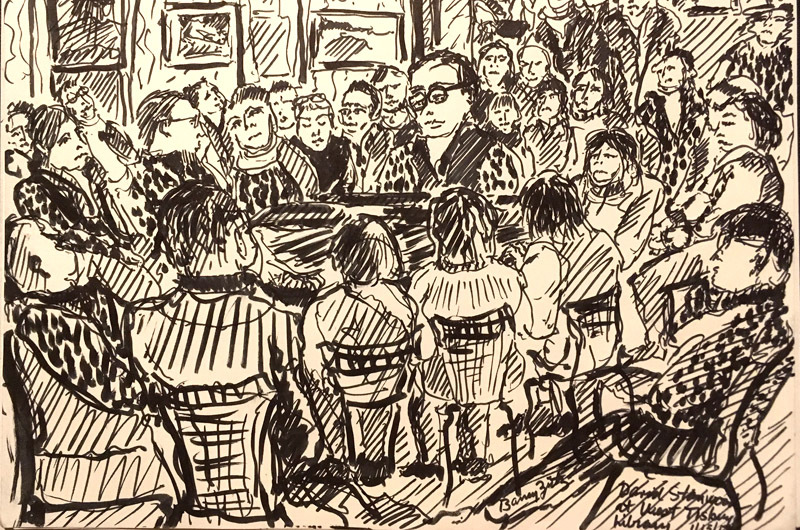 Intently, with free and light gestures, he drew faces in the audience, capturing their silent rapture as they sat there, cloistered around David and his piano on a cold night in West Tisbury. It was a magic and mutual performance, friends gathered around a kind of Steinway campfire, as they would later do at David’s after-concert party in his backyard around a real bonfire of brush cleared from his land, near to the barn where his herd of sheep lay listening. Overhead the night was clear and we saw sparkles from the fire rise to blend with a star path of constellations. Canis Major and its bright star, Sirius, Orion and his famous belt, the sharp face of Taurus and the gassy glow from the Pleiades. David Stanwood’s CD, Six Meditations, is available for purchase at the Peter Simon Gallery in Vineyard Haven and Pathways Art Gallery at the Chilmark Tavern. It can also be streamed or ordered at stanwoodpiano.com.